Here at Los Angeles Plumbing and Backflow Testing Inc., we have mastered the process of Foul Odor Location and Repair. We have traveled throughout California helping customers who have spent thousands of dollars on unnecessary repairs. 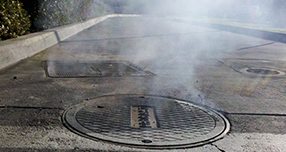 Our Company has the proper diagnostic tools and experience needed to pinpoint and repair the source of foul odors. Call us today to eliminate those foul odors affecting your business! Has your restaurant or place of business ever experienced a foul odor that just will not go away? Have you had our competitors tell you there is no solution? Have you spent hundreds if not thousands of dollars with no improvement? We have the solution to your problem. Copyright 2019 © Los Angeles Plumbing and Backflow.